Home / Flying Squirrels / FS2 Weather update for May 16th 2018 – Looking GOOD! Weather forecasts continue to be good for launch on Saturday May 19th. Winds are predicted to be light. I ran a prediction comparing a theoretical launch today (May 16th) vs our planned launch on the 19th. I combined both predictions into a single graphic below. 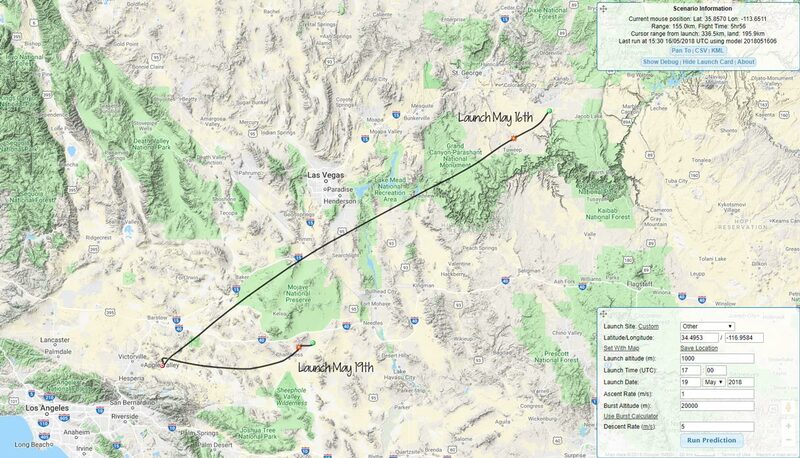 As you can see the winds today would carry the balloon out to the north rim of the Grand Canyon south of Kanab Utah. The winds on the 19th are predicted to be much lighter and the expected path reaches only the Cadiz area south of The Mojave Preserve in eastern California. The flight time for both scenarios is the same (5hrs 56 Min), the only difference is the expected wind conditions. The lighter winds favor a possible recovery of FS2 simply because it will land closer to home.